Our overall hypothesis is that detrimental reprogramming of smooth muscle cells (SMC) destabilizes atherosclerotic plaques and that there are critical genetic determinants of coronary artery disease risk that act in part by impacting SMC phenotypic transitions. to use complementary human and mouse studies to determine mechanisms by which these cells impact lesion pathogenesis and to identify novel therapeutic targets that promote beneficial (plaque stabilizing) changes in the phenotype of SMC and other extracellular matrix producing cells. The course from a healthy vessel to myocardial infarction may pass through different pathological features. PlaqOmics will focus on the role of SMC, specifically in unstable lesions, i.e. 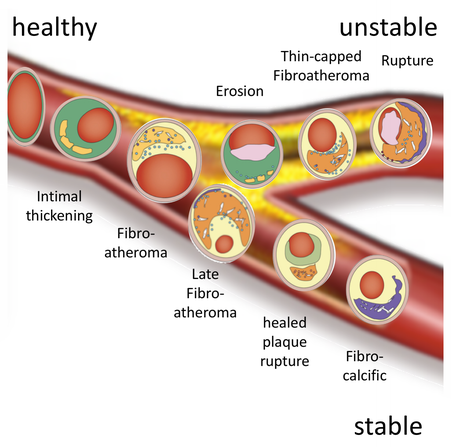 erosions, thin-capped fibroatheroma or ruptured plaques (modified from Virmani et al. 2016).